The Hampton Roads real estate market is off to a slower start in 2014. Residential listings for sale are up slightly from the prior year, while residential pending and settled sales experienced declines when compared to January 2013. Conversely, the distressed market improved slightly in January. Residential active listings increased a marginal .52% year-over-year to 10,222 units. Of the region’s seven major cities (Chesapeake, Hampton, Newport News, Norfolk, Portsmouth, Suffolk and Virginia Beach) Suffolk and Newport News saw the largest increases in the number of home for sale at 12.23% and 1.35%. Chesapeake and Portsmouth experienced the greatest declines year-over-year at 3.34% and 1.21% respectively. There is currently 5.72 month’s supply of inventory for the region, up slightly from last month’s 5.45 months, yet down 7.44% from January 2013’s 6.18 months. January’s residential pending sales experienced a 4.46% decline year-over-year. This is the first year-over-year decline the region has experienced in residential pending sales in more than two and a half years, since April 2011. Suffolk and Chesapeake saw the largest declines at 30.69% and 14.02% respectively, while Portsmouth and Norfolk were on the opposite end, with residential pending sales increasing 42.19% and 10.47% from 2013. 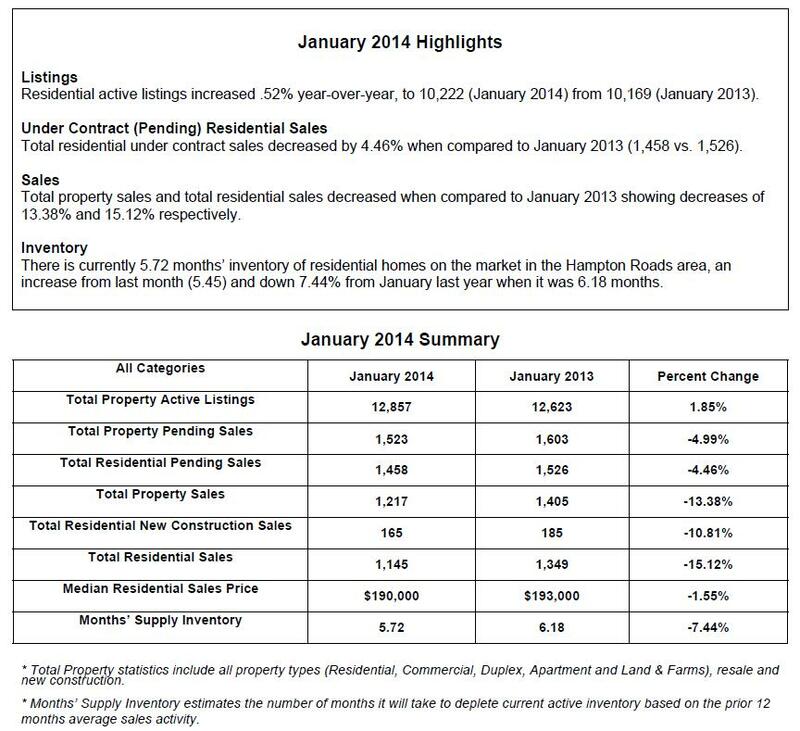 Residential settled sales declined as well when compared to January 2013. The region experienced a significant 15.12% year-over-year drop in residential settled sales, the first such downswing since December 2012. Each of the region’s major cities experienced a decline, with Chesapeake and Portsmouth undergoing the most significant regressions at 29.96% and 27.38%. Newport News and Norfolk saw the lowest declines when compared to January of last year, at 5.88% and 8.70%. The region’s January median sales price dipped a nominal 1.55% year-over-year, now at $190,000 vs. $193,000 in January 2013. Two significant weather incidents occurred in the Hampton Roads area in January, possible impacts to the final number of pending and settled sales. Snow events such as these can substantially affect the ability to show properties, and may even delay closings, as settlements often occur at the end of a month (the second snow storm occurred January 29th). Distressed homes, those that are either foreclosures or short sales, made improvement in the local real estate market. In January 2014 distressed homes accounted for 21.25% of all active residential listings, which is down 5.75% from January 2013 and the lowest since September 2010’s 20.95%. Distressed homes accounted for 29.49% of residential settled sales during January 2014. This makeup is 5.39% lower than that of January 2013, when they accounted for 34.88% of residential settled sales.